Before we can examine kanban vs scrum, we need to understand the origins and basic principles that govern each methodology individually. Part 1 of the kanban vs scrum series will focus on Kanban. 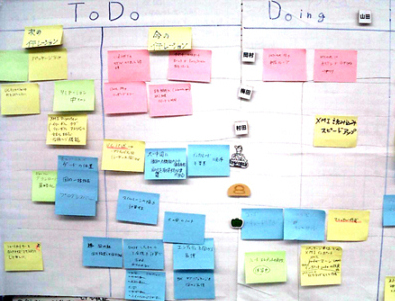 – Derick Bailey, LosTechies.comFrom the Japanese word meaning “visual card”, Kanban helps individuals harness the power of visual information through cues (like sticky notes) on a board to create a representation of their work. Kanban was first used by Toyota factory line workers back in the 1940’s (source: wikipedia.org). Back then, big cards were used to clearly identify and signal the next steps of the manufacturing workflow. In short, Kanban helps to focus teams to work more productively and it gives the brain exactly what it needs – stimulating visual cues that can quickly and easily be interpreted and understood. For instance from this image we can see that I currently only have one task open (hooray!) and three tasks in progress. I was able to quickly get this information by simply looking at my visual board. Next week, we will continue our kanban vs scrum blog series with a closer look at scrum systems and how they can help your teams work more productively. In the meantime, we would love to hear your thoughts on kanban vs scrum: Which methods do you and your team prefer? Share your thoughts with our readers below! SDLC Methodologies: Agile or Waterfall?